Some of the strangest forms of life on Earth live in the coldest and hottest environments. As long as there is a source of water, life is likely to be found. That's why any hint of water on Mars or Venus or other bodies in our solar system is big news. Scientists recently found diverse bacteria thriving in an buried Antarctic lake, an environment devoid of oxygen, saltier than the ocean and a frosty -13°C. That hints at the possibility of life on frozen worlds like Europa. Has life always been as we "know it" today? Quite possibly not. The genetic instructions in plant and animal life is currently based on DNA, with a deoxyribose based backbone. Before that, it's thought that life may have been RNA (ribose backbone) based. But what came before RNA? One hypothesis is that hereditary molecules were built from aminoethylglycine (AEG) peptide nucleic acids. One problem with that theory is that AEG had never been found in nature - up until now. Scientists have found AEG inside cyanobacteria that live in extreme environments, such as hot springs. It's a far cry from finding AEG-based life, but the fact that AEG can be biologically synthesized makes that hypothesis less unlikely. 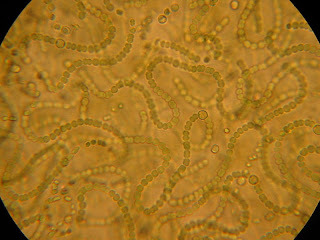 Image: Filaments of cyanobacterium Nostoc colonies. Uploaded by Thibul at fr.wikipedia. Shared under a CC-BY-1.0 license. • Do we only use 10% of our brains? Some myths keep being debunked over and over. One such idea is that we only use 10% of our brains, leaving some 90% just idling. In science fiction that often is used as an explanation why a character has psi powers or superintelligence: they have a mutation or took a drug that allows them to use that normally "unused" part of their brain, unlike us normal folk. It's annoying, because it's simply not true. "It is true that nature can sometimes involve some strange designs, but to evolve to have a brain ten times the size we needed would seem very odd, when its large dimensions are so costly to our survival, leading on occasion to obstructed labour and the death of a mother during childbirth if no help is available." "this fiction went right to the worst that I was seeing in the real world around me, but then she also suggested we can still do better, we can still survive, grow, change, improve"
Dawn is the first novel in Butler's Xenogenesis Trilogy. It takes place on a mostly depopulated Earth which has been invaded - or perhaps rescued - by aliens. The surviving humans must choose whether to adapt to an integrated hybrid human-alien society or fight for independence. If you haven't read the series you should do so! I've always wondered about the legitimacy of the "10% theory" when watching movies or television programs that use it to their advantage. It does not make sense that we only use 10% of our brain when damage to even the smallest section of it can have disastrous effects on personality and behavior. Even neurodegenerative diseases like Parkinson's, that causes profound changes in one's mental capacity, affect less than 90% of the brain. Furthermore, the nervous system functions through a connection to all neurons in each system of the brain, meaning that a lack of use by 90% of the brain would cause severe problems in the function of the body. Here is a document from the University of Washington that delves deeper into the explanations I just laid out. Thanks for the information, very nice and helpful.